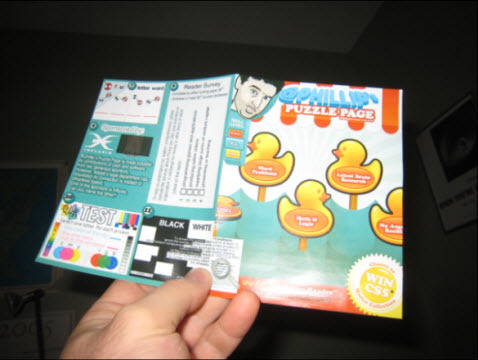 Phillip Kerman blog » Blog Archive » @phillip’s Puzzle Page is printed! @phillip’s Puzzle Page is printed! For well over a decade I’ve been producing printed handbills. Starting with years of the all text, very dense, “The Phillip Newsletter”. It would have hidden puzzles once in a while but it was very dry overall. I produced a Wanted Poster a couple years ago as my first venture in graphic color printing. That was followed by the old timey style true handbill. Naturally, there’s a good chance you have one or more of these artifacts! Anyway, that last handbill was never mailed or stacked for people to pick up, but always handed by me personally. Well, nearly 100% of the 3000 I estimate I handed out. So, anyway, you can TRY to do the puzzle page from the soft version below. I really have to be clear that I don’t believe it’s very easy to solve all the questions without having a properly printed version. 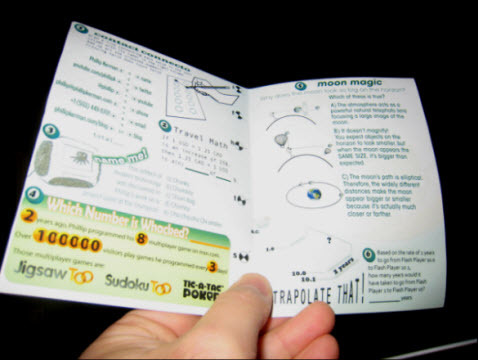 However, I will also say the puzzles aren’t terribly difficult and they are all very do-able. They’re not arbitrary. And, now that I’ve handed out about 300 I can safely say there’s nothing of significance that I’ve discovered that make these puzzles unclear or unfair. I’m not changing anything if I have to print more. By the way, thanks to Influxis and for sponsoring my handbill! This entry was posted on Saturday, May 22nd, 2010 at 10:29 pm	and is filed under contest, My Work, self-employment, Technology. You can follow any responses to this entry through the RSS 2.0 feed. You can leave a response, or trackback from your own site.